Legen Sie diesen Artikel in den Warenkorb und Sie bekommen den Tektronix-Katalog kostenfrei innerhalb Deutschland von uns zugeschickt. As a world leader in test, measurement, and monitoring, Tektronix is one of the principal players in enabling the onvergence of computers and communications. Almost every time you view a Website, click a mouse, make a cell phone call, or turn on a TV, you touch the work of Tektronix. Our products and technologies populate the design centers, laboratories, and communications networks of virtually every global leader engaged in pushing the information technology envelope. Headquartered near Portland, Oregon, Tektronix traces its roots to the electronics revolution that took hold after World War II. The company’s founders invented the world’s first triggered oscilloscope in 1946, a significant technological breakthrough. This led the way for Tektronix to emerge as one of the largest test & measurement companies in the world, with a market cap of about $1.5 billion. Tektronix is truly a global company with operations in North and South America, Europe, Asia Pacific, China, and Japan. We have manufacturing sites, development centers, and distributors strategically located in more than 20 countries worldwide to support our global customer base. 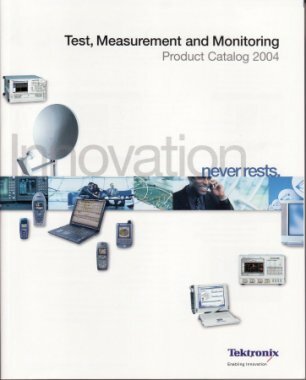 Tektronix manufactures more than 1000 test, measurement, and monitoring products, including solutions for computer, communications, and advanced electronics design; digital video; optical networking; and wireless communications. Innovative technology is at the heart of what differentiates Tektronix from our competition. Whether it’s our very high-speed ASIC designs, our world’s fastest digital acquisition engine, or any of our other areas of technology strength, our core technology has been helping us to win business and again market share. Tektronix holds approximately 675 patents in the US and continues to innovate, receiving almost 60 new patents per year. Tektronix enables our customers to design, build, deploy, and manage next-generation global communications networks and advanced technologies. Special sensors convert forces, like energy or light, into electrical signals, which enable scientists, engineers, technicians, and others to “see” and study them with oscilloscopes. Viewing these signals is a requirement for anyone designing, manufacturing, or repairing electronic equipment. Tektronix’ first oscilloscope was introduced in 1947. It quickly became the industry standard, and we have been the clear market leader in oscilloscopes ver since. In fact, in the most recent market share study, Tektronix holds a 48% share, which is over three times the next closest competitor. But, Tektronix is not just a share leader; we are also recognized as the leader in innovation as evidenced by our many industry awards. that debugging problems with an oscilloscope was too difficult because of the numerous inputs required. Logic analyzers, with multiple inputs, were designed to meet this market need. Around the world, Tektronix equipment is used to ensure delivery of the best possible video experience to the viewer, be it by watching traditional television or viewing streaming media over the Internet. Tektronix video test products can be found in virtually every television facility in the world. Our six Emmy™ awards are a testament to our innovation and leadership in this industry. From simple measurement devices, such as waveform monitors that verify video signal levels, to today’s sophisticated MPEG-2 bitstream evaluation tools, Tektronix enables the uccess of the established and emerging players in the video industry as it continues to evolve. Tektronix products address a variety of needs in the mobile industry with products focusing on protocol test, wireless field test, and mobile handset test. These products offer solutions to handset manufacturers, network element manufacturers, and network operators. By understanding the needs of our key customers, Tektronix created an entirely new product category when releasing a hand-held test tool used to test wireless network base stations. As signals increase in both complexity and speed, they often lose their standardized shape and become very difficult to interpret. Because of this, Tektronix testing equipment is required to ensure that the senders and receivers can identify the errors, and make adjustments necessary for accurate interpretation. Tektronix’ optical test products focus on high-bandwidth sampling and optical parametric test.